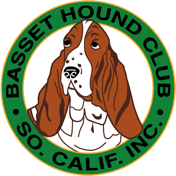 Don & Pam Bullock of Woebgon Bassets have had the experience of packing up all their dogs and necessary items due to an approaching wildfire. Fortunately the fire didn’t come close enough for them to have to follow through with the evacuation. Their experience, however, taught them that they weren’t ready when the time came time to evacuate. Those of us living in Southern California do need to be ready for an emergency. While we’re not vulnerable to hurricanes and tornados like people in other places Southern California is prone to earthquakes and wildfires. That’s why the BHCSC asked Mary Lukins to make her presentation on first aid and emergency preparedness. 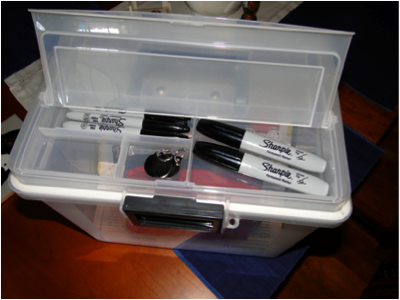 We found a suitable water resistant box at Staples to store our materials in. It has a permanent place in our home near the front door. 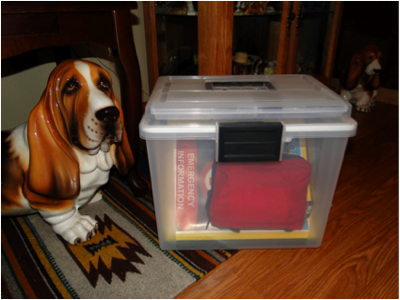 Inside the box we have placed items that would be needed in an emergency especially if we had to evacuate our home. The rim of the box forms a water resistant seal to protect the contents. 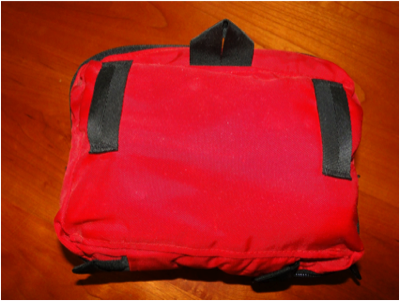 The red bag on top contains emergency medical supplies in a small package that Mary Lukins suggest in her presentation on First Aid. It even has loops that allow it to be worn on a belt. We found the bag at a camping/hiking supply store. 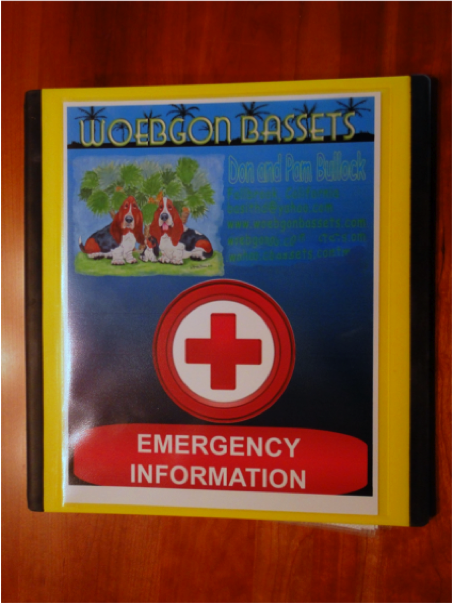 The box contains a book with emergency information about us and our dogs (see below). We’ve also included the printouts on First Aid, Bloat and First Aid Supplies as well as information of Emergency Preparedness. The book contains two plastic sleeves with of information about each dog. We made two copies for each dog in case we have to be separated from the dogs. Whomever keeps each of the dogs for us will get one copy while we retain one with us. 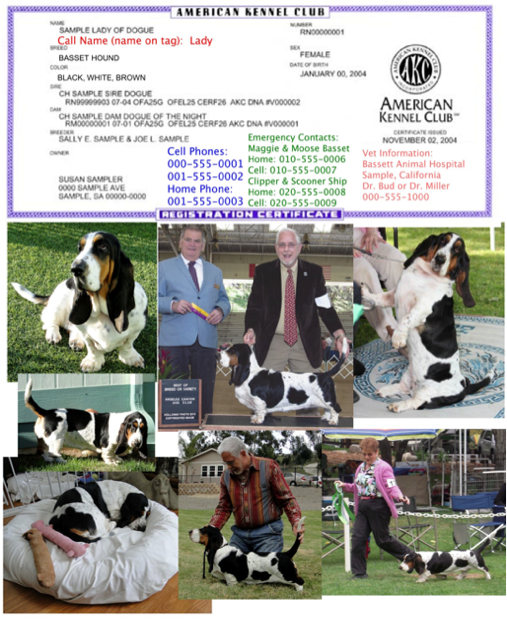 Using Mary’s presentation as a guide, we decided to make a copy of each dog’s AKC Registration Certificate. To that we added our cell phone numbers plus information about our vet and our emergency contacts. Below each certificate we included pictures of each dog. One is a picture of them stacked (show pose) with one of us in the picture. Also included are other pictures of them that were taken around our home or at shows. These pictures are important for the dog’s identification and proof that each of our dogs belongs to us. 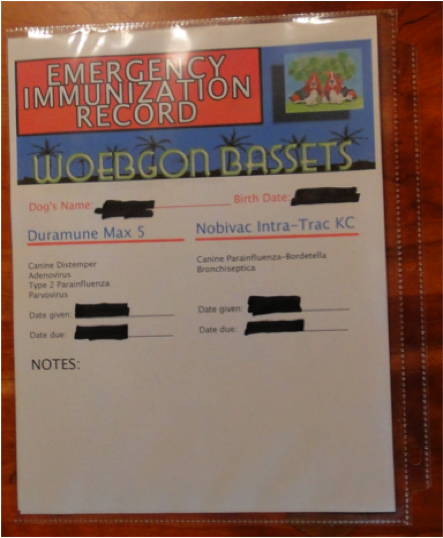 Also included in each of these sleeves is the dog’s immunization record plus a copy of the dog’s rabies certificate (it’s under the immunization sheet). Creating these sheets for the book was easy to do using a basic graphics/word processing program on our computer. The sleeves came from the store where we found the box. These information sheets would also be helpful if one of our dogs should get away from us or get out of our yard. We could use the sheets as proof of ownership when the dog was found. Having information about your dogs and current pictures for identification is very important. We update these sheets and our book whenever necessary. 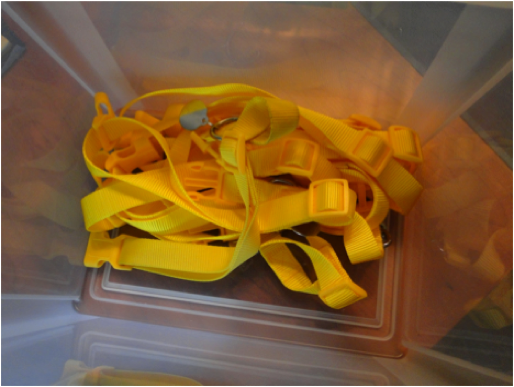 At the bottom of the box we have emergency collars for each of our dogs. We chose to buy a bright yellow collar for each dog that just snaps on. Mary suggested selecting a uniform color for all dogs that we own. That makes our dogs easy to spot in a group. Any bright color will work. The collars we selected snap on rather easily. There isn’t a buckle to fumble with. Attached to each collar is a tag with our names and cell phone numbers. While we do have regular collars for each of our dogs with their names and our telephone numbers we added these to the emergency box so that each dog would have a matching collar that is easy to recognize and an ID tag even if we couldn’t get to the laundry room where we hang their regular collars. In and emergency if at all possible each dog would wear both collars. Yes, we have more collars than we have dogs in case we have a litter of younger bassets when an emergency occurs. It’s better to have extras than not enough. Since these pictures were taken we have added some items to the box. They include portable battery operated radio, some emergency lights, a whistle, a note pad, regular ink pens, a small first aid kit for people, a collapsable water bowl (yes, we need more), poop bags and plastic trash can bags for sanitation purposes. We also have at least one flashlight with fresh batteries in each of our vehicles. We have also readied other emergency materials for our dogs. Leashes with chain collars are placed at the two major exits to our home. At each exit we have more than enough leashes for all our dogs since the number of dogs we have at home fluctuates over time. All our medication for the dogs is stored in one place and could easily be grabbed in an emergency. Our dog food is kept in sealed containers. 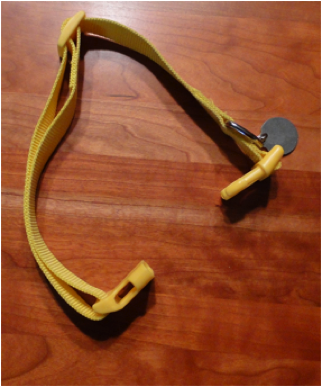 They are handy to grab and place in a vehicle if needed for an extended evacuation. Out in one of our storage sheds we have water stored in gallon bottles that we refresh every six months. Food bowls and water dishes are also stored outside the home in the same place as our emergency water and would be easy to pack in an emergency. Pam always has several bottles of bleach readily available. It would be important for sanitation purposes to take a bottle in case we need to evacuate. Each of our vehicles is equipped with at least one dog crate and we have adequate crate space to evacuate all our dogs if necessary. Extra crates and ex-pens are also stored outside our home in storage bins. They might be necessary if we anticipated an extended evacuation. Communications in an emergency can be critical. Yes, we all have cell phones available to keep in touch with each other as well as others. But, we discovered in a recent emergency that the cell phone system was overwhelmed. Calls weren’t going through. In order for us to contact each other on our property or in vehicles if we had to evacuate we have some CB radio walkie talkies. They sit in a charger in our laundry room so are fully charged at all times. They allow us to be in constant communication with each other as we’re moving around the property and packing our vehicles. 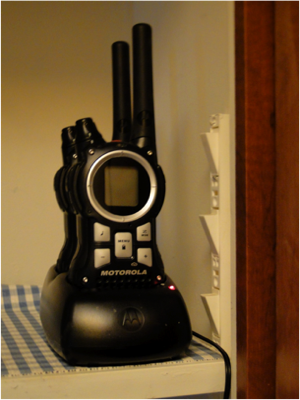 We have also added some additional walkie talkies that use regular AA batteries to our Emergency Kit. Once we leave the radios can provide vehicle to vehicle communication so that we can decide which route will be the safest and which of our evacuation locations we’ll go to. Changes to that plan can also be made as needed. We are currently working on a list of things to pack in case of an emergency and we have time before we need to evacuate. Once we are certain that the list is complete we’ll make it available here. In the mean time you should start your own list. The links from AKC, FEMA and the CHF provided on the Emergency Preparidness page will give you ideas for your list. Making a list before an emergency will better prepare you for when one happens. As most of us learned in school, practicing for emergencies is important. We went through frequent fire drills and other emergency drills every year. Unfortunately most of us never thought of practicing at home. If you had to evacuate your family and all your animals right now could you do it in a very short period of time? You can only answer that question if you have actually practiced evacuating. Give it a try and see how well you do. You’ll also discover ways to improve on your evacuation plan. 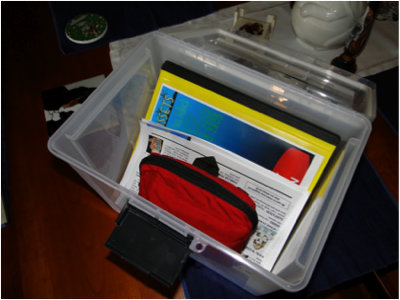 Again this is only meant as an example of an emergency kit and emergency preparation. You may find a better way to fit your situation. The most important thing is to adequately prepare and practice before there is an emergency.